Watts is one incredibly special little guy... reserved with the most joyful, endearing inner spirit that comes out in the form of wiggles and thumping tail wags! Watts has a lush, silky smooth white coat.. and of course you can tell by a few of his pictures he's got a pretty unique dental situation! 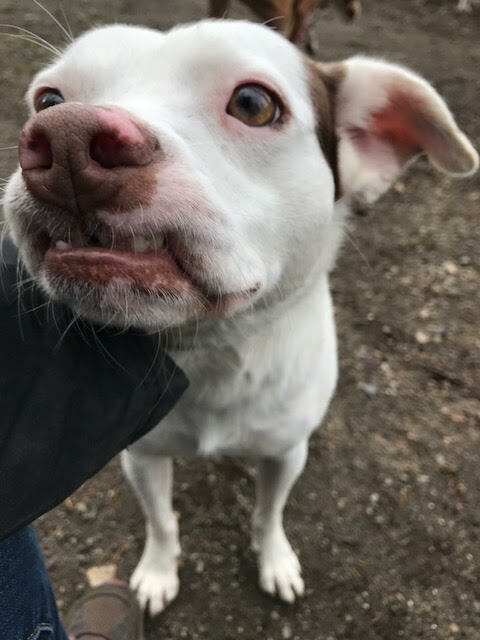 Completely harmless but comical, his front teeth are all crooked and his lip always gets stuck when he closes his mouth creating hilariously funny faces! He also has a very unique look to him.. he's got a small muscular body with this teeny little head and skinny legs. Just to die for!! You'll see in his videos below, Watts has some places where he has become super comfortable (that shows with high happy tail, head held high, loose body and relaxed eyes) and other, new areas on the property that cause him to shrink into his shell like a turtle. Like we do with all of our dogs, as soon as they arrive here they are put in a very predictable and simple routine with handlers that complement what the dogs needs at that time. Watts got comfy within his routine in a short period of time. in the meantime he quickly began to trust and adore his handlers and trainer. ​Most reserved dogs like Watts are concerned with human movements and change in environment.. any sort of pressure sends them into hiding.. while this is true with Watts at times, he also blooms when shown sweet, gentle affection with soft high pitch voices. He likes you to come down to his level and share space without any agenda. As you talk to him, he'll slowly inch closer to lick you softly right on the lips, tail thumping away in the background! It's an incredible moment when you see his worries fade away and he's just happy to be in the present moment with a new friend. Watts loves other dogs and thrives in playgroup with his buddies Finney, Jessie and Orly. He is absolutely his happiest out there.. you'll see his tail whipping in huge circles, mouth WIDE open with a huge smile and wiggles all over the map. He runs up to his human friends and does a sweet lean looking for affection. Watts has only been with us for two weeks so we are still getting to know him and his true personality under his guarded layers. he really is a dog that once you meet him, you will understand just how special he is! Stay tuned for updates but in the meantime, come out to meet this gentle soul!